As a group exercise instructor, you’ll have heard the word ‘trends’ a lot. Not to be confused with a ‘fad’, which dies out as quickly as it started, a trend is a result or change in development in response to societal changes and behaviours. Whether talking about strength training or yoga, trends are a big part of the fitness world. In fact, exercise trends are discussed and predicted at least annually. One trend that has been researched at length is that of active ageing. Active ageing (also known as healthy ageing) is defined by the World Health Organisation as “the process of developing and maintaining the functional ability that enables wellbeing in older age”. In Layman’s terms, being fit enough to cope with life as an older adult. In the 2018 Survey of Worldwide Fitness Trends, published by the American College of Sports Medicine, fitness programmes for older adults ranked number nine in the top 10 trends. When we look at the statistics on ageing in the UK alone, it’s easy to see why this ranked so high. The over 85s is the fastest growing demographic, with 2017 seeing 579,776 people aged 90 years and over living in the UK, including 14,430 centenarians. Compare this to the reign of King George V and the nine letters he sent to centenarians in the first year of the tradition and you’ll quickly see how far ageing has advanced in the last 100 years. Luckily, fitness organisations are now addressing the need for programmes that specifically cater for older adults. One such organisation is Move it or Lose it, whose ethos has been to get older adults moving. Move it or Lose it have worked closely with Centre for Healthy Ageing Research at University of Birmingham to ensure their FABS instructor training – flexibility, aerobic, balance and strength – is suitable to train specialist instructor to work with the over 60s. At their recent annual conference, Move it or Lose it presented some of the problems an ageing population presents and how group exercise instructors can work to improve healthy ageing for all. Inactivity is already a huge problem in our society. At a cost of £1bn per year to the NHS, physical inactivity lends itself to illnesses such as cancer, cardiovascular disease, type 2 diabetes and more. In terms of older adults, inactivity is statistics are shocking. Cited from the recent ukactive Reimagining Ageing report, “Approximately 38% cent of people aged over 55 are classed as “inactive”– meaning they fail to achieve half an hour of moderate to vigorous physical activity a week. Sedentary behaviour also becomes more prevalent with age: close to half of people aged 75 – 84 are inactive (48%), alongside nearly three quarters (71%) of people aged 85+”. Professor Janet Lord addressed the conference on ways in which older adults benefit from physical activity – and one such activity may shock you. HIIT (high intensity interval training) has been cited as an activity that can get older people moving. Although there are certainly exercise adaptations you make when teaching your classes, these are a great way to engage people quickly, especially with time being a key factor in why people don’t participate. Amanda Casey from Aston University addressed the conference on balance and how this instability affects the ageing population. One in five over 60s experience balance problems that affect their day to day life and Age UK states that “Falls are the number one reason older people are taken to the emergency department in hospital”. As such, as key challenge to people with balance problems is getting active for fear of falling. However, there are ways of adapting exercise to ensure this demographic is catered for in a way that is both safe and effective to them. As an instructor, there are a variety of options available to you should you wish to assist older adults in strengthening their balance. Mat based Pilates has been cited as a safe exercise form for those with balance and stability issues. A study published in the Journal of Physical Therapy Science found Pilates was not only good for improving balance in both static and dynamic movement but was also a safe way in which to exercise. There are currently 887,000 people participating in Pilates on a monthly basis and currently sits as the number two most participated in group exercise style in the UK. Balance is one of the key components in the Move it or Lose it FABS programme. Understanding the challenges those with balance issues face and the adaptable exercises that can make positive impacts on them opens a variety of additional options to instructors. With specialised training, a strengthening group exercise offering allows for more people to reap the benefits of physical activity whilst alleviating their fears. The need for more instructors trained in the above is clear. Professor Tracey Devonport’s cited a 2017 NICE report to highlight the demand; 300,000 patients presenting fragility fractures are admitted to hospital in the UK each year. The time for falls prevention and balance stability is now. Dr Zoe Wyrko and Dr Afroditi Stathi addressed the conference on how important social engagement is to older adults. You may be familiar with the work of Dr Wyrko, who featured in Channel 4’s Old People’s Home for 4 Year Old’s, showing the positive impact intergenerational interaction can have on the lives of the older adults. Dr Stathi posed the question “How many doors do instructors open?” Answer; many. Instructors are not only the gateway to physical activity, but also to self-esteem, confidence, making new friends and more. 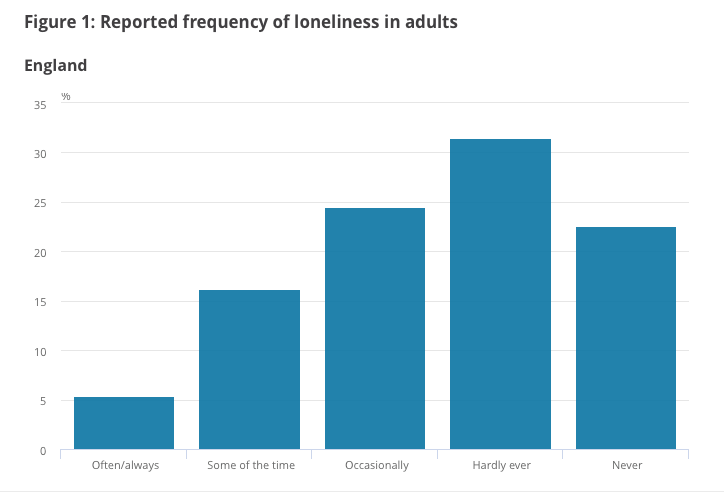 There’s been a lot of press coverage recently about how the UK is in the throes of a loneliness epidemic. Figures published in April from the Office for National Statistics revealed that more than 5% of adults in England felt lonely “often” or “always” between 2016 and 2017 (that’s one in every 20 adults), with 16% enduring feelings of loneliness sometimes, and 24% occasionally. But is slowing down linked to natural ageing or to the views we hold as a society? RSPH’s research identified a wide range of ageist attitudes but noted that survey respondents viewed getting older most negatively of all when thinking about three things in particular: participation in activities, memory loss and appearance. Ageist attitudes harm older people as they lead to discrimination, which can promote social exclusion, affect employment opportunities, and have a huge impact on both physical and mental health. A big concern is that as people grow older, many start to apply negative age stereotypes to themselves. As this happens, they begin to believe that they really are too old to participate in activities, become withdrawn and inactive, and soon start to suffer physical and mental health problems as a result. The RSPH study notes that previous research has shown that those with a more negative attitude to ageing live on average 7.5 years less than those with more positive attitudes. As an instructor, you’ll understand that there are many ways in which group exercise can combat loneliness. Bonding with a group helps people get motivated and meet their fitness goals, and social influence really does play a key role in motivating participants. Never underestimate the power of group exercise. If you’re an instructor looking to engage older adults in your classes and allow them to benefit from your expertise, here are some tips that could help you on your way. If you’re a group exercise instructor and are looking for ways to make your classes more inclusive for older people, get in touch with EMD UK today to find out how we can help you. EMD UK would like to thank Move it or Lose it, along with the following speakers: Professor Janet Lord, Amanda Casey, Professor Tracey Devonport, Kerry Matthews, Dr Zoe Wyrko, Dr Afroditi Stathi and Dr Louise Newson.